Cuba's small but growing Muslim community is getting a boost from Havana's diplomatic opening. Riyadh, meanwhile, is trying to exert control. HAVANA — Appearing at the bend of a paved street in central Havana, an ebony face veiled in blue contrasts with the surrounding landscape of Cuban clichés. There is the pearly silhouette of a dominating white Christ on the Malecón esplanade, the usual ballet of vendors selling bad cigars and bookkeepers unpacking their countertops with old books on the glory of Fidel Castro to fascinate Western tourists. Sitting on the terraces, two young female followers of santeria — a familiar Caribbean religion that mixes Christian traditions with African beliefs — discuss amongst themselves, all dressed in white and hidden from the sun behind their umbrellas. And that blue-veiled face, Zakina, is heading toward a small minaret overlooking the roofs of the historic neighborhood of the Old Havana. Zakina is heading to the first — and only — Muslim prayer room in the capital. Inaugurated two years ago in an old government building and renovated with the shared backing of the Cuban state and Saudi Arabia kingdom, the prayer room was baptized "Mezquita Abdallah" and welcomes dozens of praying faithful each day. Sometimes people look at us on the street like we are bizarre," says Zakina. "Or they mock us for wearing a veil on our heads in this heat. It's not easy. "Before, we would pray at our own homes or the homes of others," explains one of Zakina's friends. "It's very important to have a place where we all can come together and exchange our faith." The prayer room provides bilingual Korans in Arabic and Spanish, printed in Saudi Arabia, while the religious teachings are shared by local Muslims or members of the Saudi diplomatic corps. In this busy street that connects Plaza de Armas to Plaza de San Francisco, the followers continue to flock. Some men arrive in pants and shirts. Others try a more traditional outfit. Some women wear a simple veil. Others wear a hijab. There is no one with the full-covering niqab or burka. "Sometimes people look at us on the street like we are bizarre," says Zakina. "Or they mock us for wearing a veil on our heads in this heat. It's not easy." Having converted six years ago, Zakina, whose birth name was Rosa, is a Cuba native and self-taught Muslim. The absence of muftis, mullahs, intellectuals or other Islamic spiritual leaders in Cuba makes the discovery of this religion difficult for new followers. At the same time, with limited access to the Internet in the closed-off Communist nation, much of the information on the practice of the foreign religion comes by word-of-mouth and from stories of those rare people who've traveled to Muslim countries. There are also scenes from Turkish television series like Muhtesem Yüzyil (The Magnificent Century) downloaded illegally and resold on USB keys on the black market. Each has their own way of discovering, appropriating and practicing their new faith. 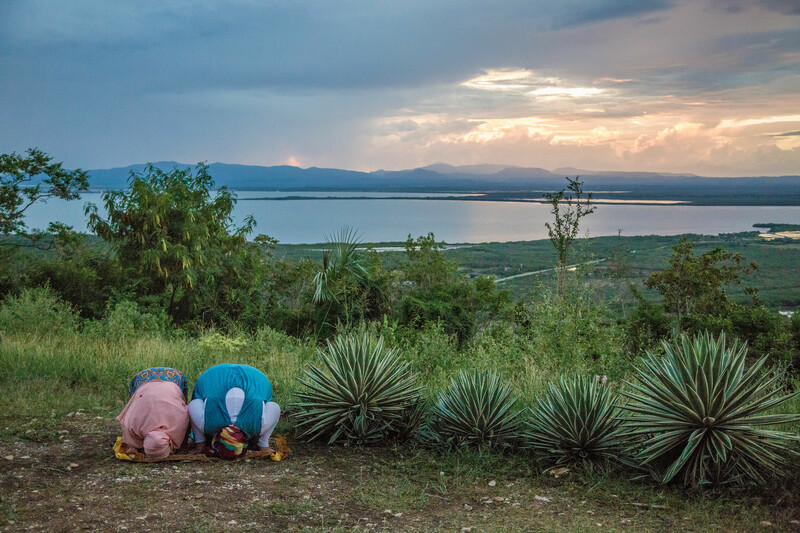 The presence of a Muslim community in Cuba, discreet as it is, is not missed by the Westerners who, in passing before the prayer room, scrutinize its interior with curiosity. The sublime churches of the country, such as the Baroque cathedral of the Virgin Mary of the Immaculate Conception, feed Cuba's reputation as a colorful Catholic nation. However, under the atheist regime of the deceased Castro, the practice of religion was strictly limited, and thousands of priests fled the country to the United States. It was the historic 1998 visit of Pope John Paul II that helped revive the Christian faith across the country. The origin of the Muslim community in Cuba is not really known. One of the openings to Islam traces back to a 2005 earthquake that ravaged the Kashmir region of Pakistan. After Cuba sent brigades of doctors there to help, Pakistan launched a scholarship program to allow Pakistani youth to study medicine in Cuba for seven years. And through this contact with Pakistanis who were scattered across different provinces of the country, many Cubans discovered the Muslim religion, and a few decided to convert. Over the past two-plus years, Cubans have experienced the much talked about "opening" of their country that's included a visit from then U.S. President Barack Obama, a Rolling Stones concert and Chanel fashion show. The death of Fidel Castro in November has accelerated the opening. Beside Western investors, the opening has prompted certain Muslim countries to propose new projects. During his visit to Cuba in February 2015, Turkish President Recep Tayyip Erdogan announced his desire to construct the first "real" mosque in the country. Saudi Arabia, which had already participated in the renovation of the prayer room, also plans on building a bonafide mosque. Still, nothing in Cuba is ever simple. Indeed, it is impossible to estimate how many Muslims are present on the island. According to one American statistical center, there are 10,000; while the BBC put it at 4,000. The Imam "Yahia" Pedro Sanchez, president of the Islamic League of Cuba, which was officially recognized by the government in 2007, says there are fewer than 1,000. "It is not the number that is important, but rather the strength of our faith," insists the 60-year-old, who receives us in his home, in a neighborhood on the outer edge of the capital. Reza directs the Islamic Center, called the Fatima Zahra Center, named after the daughter of the prophet Mohammed and his wife Khadija. It is a Shiite confession center where followers can come to pray under portraits of the late Iranian Ayatollah Ruhollah Khomeini and take Koranic learning courses. Reza has spent months studying in Iran at the University of Qom. "The most important thing is to bring the intellectuals of Islam to guide us," Reza says. "With all that is happening in the world today, we must preserve the integrity of Islam in Cuba. We cannot let it be invaded by extremists who have nothing to do with the religion that I have discovered and love." The terrorist attacks over the past few years in Paris, Nice or Brussels have nevertheless filtered in through Cuban television via a Venezuelan network. At many levels, the Islam of Cuba is disconnected from the problems of the Muslim world. Zakina, for example, goes to the prayer room opened by Saudi Arabia (which is Sunnite) but participates equally in the lectures and prayers at the Reza Center (which is Shiite). Still, in a country where the median salary is barley $20 per month, mere survival is still a national obsession. The new infatuation with Muslim culture has not escaped this reality. Yet, the death of Fidel Castro and the normalization of relations with the U.S. can potentially reshuffle the deck for a country that has been largely cut off from the world for 60 years. Islam, like other competing sacred and profane offerings alike, is looking to benefit from big changes afoot.